WITH THANKS TO OUR SUPPORTIVE COMMUNITY, THE EVENT IS NOW SOLD OUT! please email info@empoweringHER.org, subject line "wait list". SPONSOR the event and discover what happens when you inspire feelings of HOPE and OPTIMISM and empower a child – and a whole community. 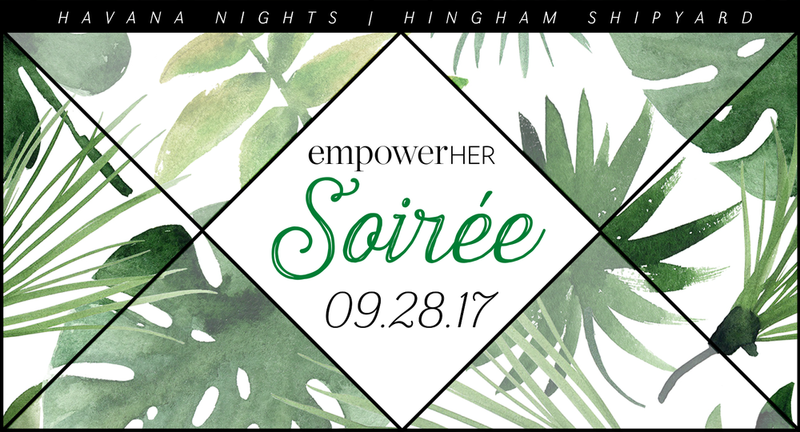 Get ready for another magical evening of storytelling and celebration at the 2nd Annual empowerHER Soiree. Our Havana Nights-themed cocktail party will welcome 600 guests at the Launch at the Hingham Shipyard. Gorgeous lounge seating by RESERVE Modern Rentals, a Rum Bar, and waterfront raw bar donated by Mullaney's Fish Market, will set the scene for the evening. Emcees Candy O'Terry and Jim Fagan will welcome guests and we will once again have the unique opportunity to hear directly from those who have benefited from empowerHER’s impactful programs. Sponsored by Hallamore Crane, Quincy Mutual, Campanelli Construction, and other South Shore industry leaders, will feature delicious bites from our generous restaurant partners Alma Nove, Trident Galley & Raw Bar, Novara Restaurant, Lavishly Dunn Catering & Events and a gorgeous pastry display by the famed Montillio's Baking Company. Attendees will enjoy a unique view of beautiful Hingham Harbor and dance the night away to the sounds of DJ Knife. A highlight video from our 2016 Soiree can be seen HERE. IMPORTANT GUEST INFORMATION: Our event is cocktail attire and will take place rain or shine on the lawn at the Hingham Shipyard. Women are encouraged to wear a wedge heel or other comfortable shoe. Get ready to show off your skills at Corn Hole and step up to Plinko. . .Yes Plinko, think The Price is Right! Upon arrival, guests will register with a credit card and be assigned a bid number in which to play all games. Thanks to our generous partner Rustic Marlin, guests will play for the chance to win one of many fabulous Rustic Marlin prizes and be entered into Grand Prize drawings to include a trip to St. Marten and more. Please also note, the cash bars are just that...Cash only! Parking is free and available at the Patriots Cinema movie theater in the Hingham Shipyard. For GPS directions, please enter 18 Shipyard Drive Hingham, MA 02043.